As always, the Sadies put on a ground-shaking live performance at Elora's Ice Jam. Dallas and Travis Good got down and dirty every chance they could, shredding their guitars for the crowd with gritty, country-western solos. 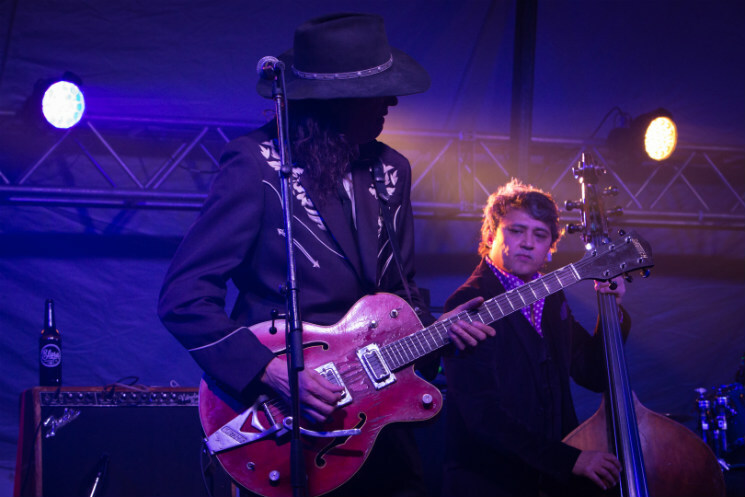 The Sadies left little room to breathe with a fast-paced, high-intensity performance. The audience was pressed up close to the front of the stage, hanging onto Travis Good's every string-pluck and moving along with Sean Dean's energetic bass. The band's set list featured a little bit of everything, including "Another Year End" from Dark Circles, as well as "The First 5 Minutes" and "So Much Blood" from Internal Sounds. They even performed their cover of the Louvin Brothers' "There's a Higher Power." At such a late point in the night, the Sadies were setting a precedent for the nostalgic happenings that were to come with the night's headliner. Still going strong after over a decade of music, the Sadies' Ice Jam performance was yet another indicator that the Canadian alt-country group still have it in them.